Bundesliga | Can RB Leipzig go the distance? Can RB Leipzig go the distance? RB Leipzig's Matchday 18 victory over TSG 1899 Hoffenheim was simply their latest exploit in an outstanding debut season, prompting bundesliga.com to ask the question: can they keep it going until the business end of the campaign? After making it through the entire Hinrunde without tasting defeat, Hoffenheim began the Rückrunde with a 2-1 loss to Leipzig at the Red Bull Arena. Julian Nagelsmann's side had gone into the game as the last unbeaten side in Europe's top five leagues. But after Sandro Wagner was sent off, the 10 men of TSG were unable to prevent Marcel Sabitzer – the man who rescued a draw against them on Leipzig's Bundesliga debut – conjuring up a late winner. That Leipzig ended up being the ones to end Hoffenheim's run should come as no surprise. The Bundesliga newcomers have been upsetting more established opponents ever since they joined the German footballing elite. They stunned title contenders Borussia Dortmund as early as Matchday 2, before hammering Hamburger SV on the road. Their confidence blossomed as they then embarked on an eight-match winning streak, which included victories over VfL Wolfsburg, Bayer 04 Leverkusen and FC Schalke 04. Something had to give. Not only had Leipzig set a new Bundesliga record for the best start by a promoted side – 13 games unbeaten – they had even gone top of the table after their thrilling win over Leverkusen. Surely it was only a matter of time before someone put these young upstarts back in their place? Step forward FC Ingolstadt 04 and FC Bayern München. The former – in spite of being bottom – inflicted a first defeat of the campaign on Leipzig, before the latter reminded them who's boss at the Allianz Arena, winning 3-0 to go back on top of the pile. And so to 2017. After sweeping aside Eintracht Frankfurt with a helping hand – literally – from Eagles goalkeeper Lukas Hradecky, Leipzig succeeded where Bayern and the rest had failed, by finally getting the better of Hoffenheim. Fitting, perhaps, that the team with the second-longest unbeaten streak in the Bundesliga this season should put an end to the longest. Saturday's game with Hoffenheim had been billed as a heavyweight clash between the Bundesliga's two most prolific German strikers – Timo Werner and Sandro Wagner. Joachim Löw even came along to enjoy the contest, and there is no doubt which man will have made a more favourable impression on the national team coach. While Wagner was dismissed for his reckless challenge on Stefan Ilsanker, Werner played a starring role in Leipzig's victory, notching his 11th goal of the campaign. From his modest beginnings at VfB Stuttgart – for whom he scored 13 Bundesliga goals across three seasons – the 20-year-old has emerged as one of Germany's most lethal frontmen since his move to Leipzig. Werner has opened the scoring four times this season, and his side have won seven of the eight league games in which he has found the back of the net. It is surely only a matter of time before he makes his full debut for Germany, who have been searching for a top-class striker since their all-time leading scorer, Miroslav Klose (71 goals), hung up his boots following Die Mannschaft's victory at the 2014 FIFA World Cup. Leipzig have made a formidable fortress of their Red Bull Arena, where they have picked up an astounding 25 points from a possible 27 this term. Borussia Mönchengladbach are the only team not to have left the stadium empty-handed, after their 1-1 draw on Matchday 4. RB's home record is the best in the Bundesliga, and they will be confident of improving it in their upcoming outings against Hamburg and 1. FC Köln, who have only picked up four away wins between them all season. Admittedly, the promoted side are also pretty handy on the road, with five wins from nine games. Their away record is second only to Bayern's, after their losses at the Audi Sportpark and the Allianz Arena, and draws at Hoffenheim and Köln. Between now and the end of the season, Leipzig will be able to focus solely on the Bundesliga. They were knocked out of the DFB Cup in August, and – unlike Bayern – they don't have to worry about the UEFA Champions League. The champions will play at least six games in February (possibly seven, if they reach the DFB Cup quarter-finals), while Leipzig will only play four. Ralph Hasenhüttl's men are therefore likely to be feeling fresher heading into the final weeks of the season – particularly the Matchday 33 clash with Bayern on 13 May, which would come several days after the Champions League semi-final second leg, should Carlo Ancelotti's side make it that far. Add in the fact that the average age of Leipzig's starting XI in the Bundesliga this season is 24, compared to Bayern's 28, and Hasenhüttl's side look to have a distinct advantage. RB will also have the luxury of a full week of training and preparation before the majority of their remaining 16 league games. There is still a long way to go in the 2016/17 campaign, and Matchday 19 will see Leipzig make a perilous trip to the SIGNAL IDUNA PARK to face Dortmund – who will be out to avenge that early-season reverse. But Hasenhüttl's players have shown on many occasions that they have the talent, discipline and determination to go far, and the Leipzig juggernaut currently shows no signs of slowing down. 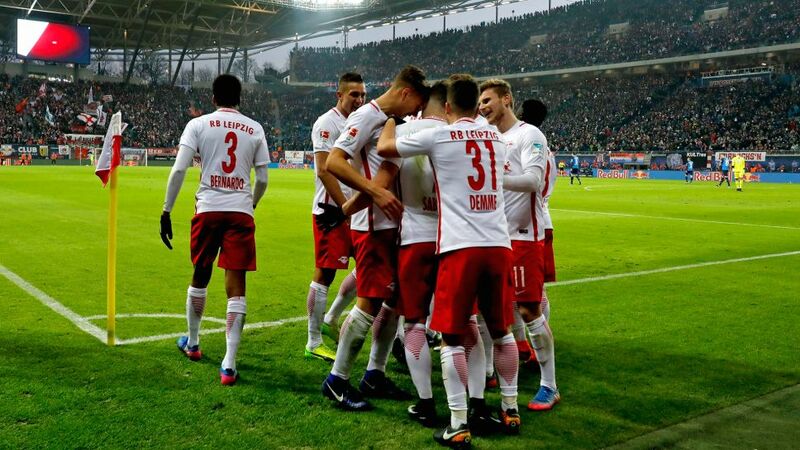 Second-placed RB have started 2017 by beating fourth-placed Frankfurt and third-placed Hoffenheim. If they can complete an impressive league double over fourth-placed Dortmund on Saturday, they will find themselves 14 points clear of the 2010 and 2011 champions. And still very much in the thick of the title race.